Water management plans are developed by the operator and approved by the regulator to effectively acquire, utilize and dispose of water used for fracking. Regulations require water applications and permits during all stages of a fracking operation. 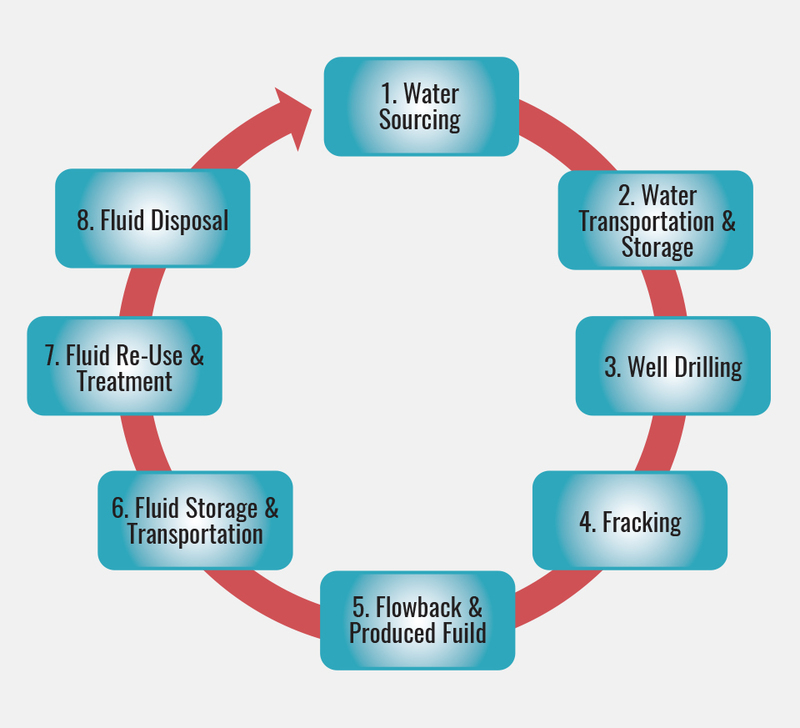 The Fracking Water Management Cycle demonstrates how water is managed during various components of a fracking operation. Industry practices and strict regulations ensure the environment is protected during each component. 3. Well Drilling requires water and the amounts needed vary from about 200 to 1,500 m3 per well. The well bore is flushed out and fluids flow back to the surface. Flowback fluids are collected and held temporarily (days to months) at the wellsite, during flowback testing and early production operations. Operators must store these fluids in tanks, c-rings or double-lined pits, depending on the jurisdiction. Typically a secondary barrier is required in the event that containment is breached. This secondary containment is designed to be capable of holding all the fluids. There are numerous techniques being developed to treat fluids for both re-use and disposal. Most commonly, fluids are passed through a 5 micron filter and treated with a biocide to inhibit bacterial growth. The fluid is usually trucked or sent via pipeline to these sites. At a disposal facility (well), the waste fluid is pumped deep underground, into a porous formation, using a wellbore reviewed and approved by the regulator.